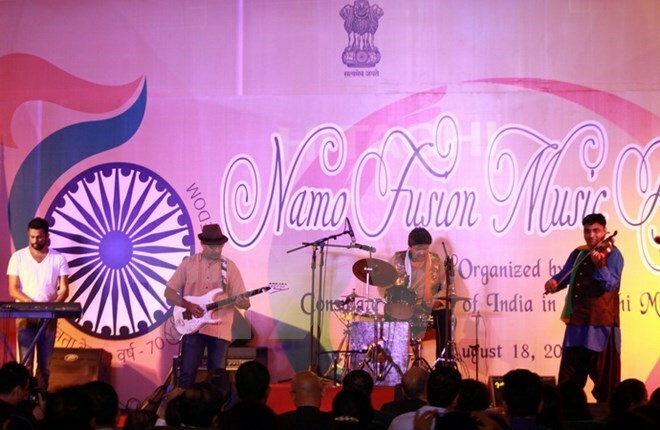 HCM City (VNA) – The Consulate General of India in Ho Chi Minh City held a music performance show on August 18 night to celebrate the 45th founding anniversary of Vietnam-India diplomatic ties. Addressing the event, Indian Ambassador to Vietnam Parvathaneni Harish stressed that 2017 marks an important milestone in Vietnam - India relations as the two countries are celebrating 45 years of diplomatic ties and 10 years of strategic partnership. The diplomat said the traditional relationship, which has been nurtured and consolidated by leaders of both nations, is growing fruitfully in various fields and benefitting their people. Apart from economic, trade, scientific and technological cooperation, cultural exchanges have also helped increase mutual understanding and solidarity between the Indian and Vietnamese people, he added.